Can I just say that this peplum romper is insane!!! This romper is perfect for the rectangle and upside down triangle body types. How I wish this would work for me?!? Unfortunately, my hips are bigger than her largest size in the non-stretch items. 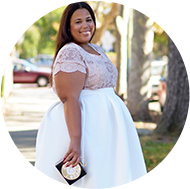 I'm loving that the plus size designers are releasing multiple collections throughout the season. It keeps up lots of fabulous options. Anyways, what do you think? My favorite, of course, is the the peplum romper. Which is yours? You can find the collection here. I'm loving that romper!!! So cute! I love the second and third looks, but all are great!! LOOOOVE the romper but also love the pink and grey column dress too! That romper is IT! Love it.